It was bound to happen. Some years back, that upstart Firefox tempted us with tabs, add-ons and fun themes. And it seems like only yesterday that Chrome’s speed and minimalist design seduced us even further. Yes, it was bound to happen. For the first time in ten years, tech blogs are reporting that Microsoft’s web browser, the ubiquitous Internet Explorer, has fallen below 50 percent of global browser usage (you have to factor in mobile browser usage to make the numbers add up). Once the undisputed leader in market share, residing on an astounding 95 percent of the world’s desktops, browser watchers say that IE is in steady decline. Whether the numbers work or not, and whether IE’s decline can be attributed more to the rise of mobile browsers, than a migration of users to different browsers, we thought it would be fun to look at which browsers avast! users prefer. 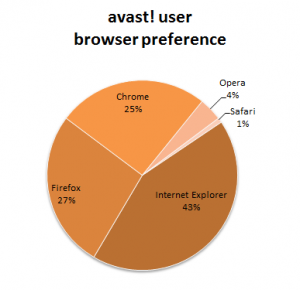 Here is a breakdown of browser usage among avast! users this year. Looks like our users are ahead of the trend! Security reminder: An interesting and dangerous fact is that there is still major usage of old versions of Internet Explorer. IE 6 and 7, which are not supported on any version of Windows, are still used by over 25 percent of Internet Explorer users, which equals a bit over 13 percent of all desktop users. Whether you use Internet Explorer, Firefox or Chrome (or any of the others), to keep your computer secure, please make sure you have the most recent browser version and install any patches that are available.